Well, I haven’t been out on a trip for quite a while. (I think the last one was with Saigon Treasure Hunt) The main reason is, I’ve been totally flat out writing and editing the second edition of my book for long term travellers. But I also I feel like I’ve been there, done that with the main attractions. Once you’ve done a food tour, day tour around town, a bicycle tour and explored District 5, you’ve seen and done all there is to do in Saigon right? Well, I’m happy to say I’m WRONG! Recently I was invited to review a new online guide service that’s launched here in Ho Chi Minh City. At just 8 months young, Inspitrip already has over 1000 local guides in 30 countries and is growing rapidly. Inspitrip’s main aim is to link visitors with locals who have similar interests. With a tagline – Connecting you to the local experience (Find local insiders and experience the destination as if you live there), it didn’t take much to convince me to try them out. I know only too well how much your experience in a destination improves by having a local contact to help you out and show you around. 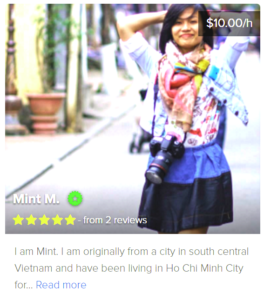 However, Inspitrip isn’t the only company that offers a local guide service in Ho Chi Minh City. There are several websites offering guide services by locals. And, some of them like Saigon Hotpot, are free. Why would you pay for something you could have for nothing? I needed to know more before I was prepared to write a glowing review. So, I set them a challenge. I wanted the guys behind Inspitrip to prove to me why they were different. And, then show me something new. Something I wouldn’t find on my own without a local contact. To make it even more of a challenge, we met up in my local neighbourhood. I’ve been here almost six months now and feel like I’ve pretty much explored all the highlights so I was a little sceptical, to say the least. Alex was an awesome guide. My guide was Alex, who is one of the founders of Inspitrip. 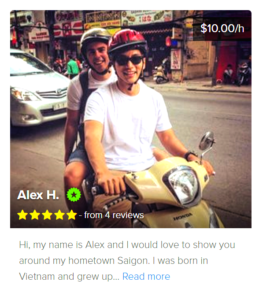 Alex was born in Saigon but moved to Australia when he was a child. Now he’s back, and keen to build something that not only helps visitors get the most out of their time in Ho Chi Minh City, but also provides opportunities for the many bright and energetic youngsters who love nothing more than to help out new friends and, earn a little income on the side. We met in one of the big local parks, and I quickly worked out that Alex knew his stuff. 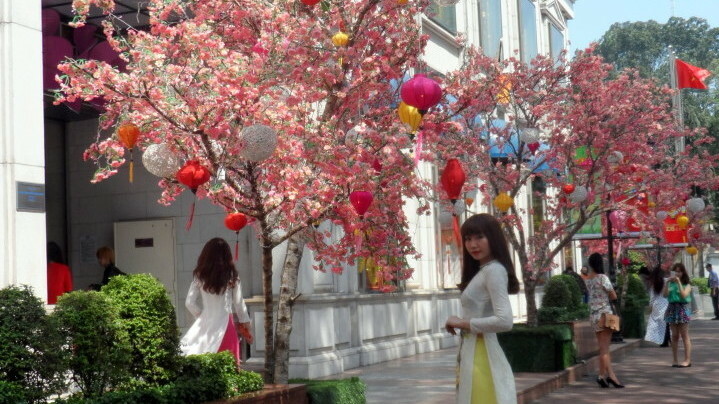 Did you know that Le Van Tam Park was once a cemetery? Er… No, I did not! You mean I’ve been drinking beers in cafes, power walking and watching aerobics sessions in a cemetery!!! And not just any cemetery apparently. The former Mạc Đĩnh Chi cemetery was the final resting place of many VIP’s and dignitaries over the years. Including former South Vietnamese President Ngô Đình Diệm and his brother and chief political adviser Ngô Đình Nhu. Even though all the remains have officially been removed, many locals are still quite reluctant to enter the site as they believe it’s haunted. Creepy! So one point to Alex. Let’s see what else you’ve got. Next we headed down Hai Ba Trung Street towards my local market Cho Tan Dinh. It’s where I do all my fruit and veggie shopping, and I’m pretty familiar with what goes on there. If you’re visiting Saigon, I highly recommend a visit as it’s probably one of the top 5 most authentic markets in Ho Chi Minh City. And, if you’re after fabric, this is the place to come. But, we weren’t heading to the actual market. 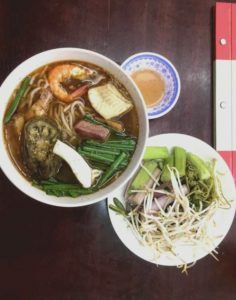 A bit further up, wedged between a BBQ place and a small shop is a small local restaurant selling specialities from Central Vietnam – Quan An Hue O Xuan (22-22B Nguyen Huu Cau, P. Tan Dinh, D1). It’s been around for over 40 years and is quite famous with the locals. And yet I hadn’t even seen it. What am I blind?? How did I miss that? And unsurprisingly, the food was really good…I mean REALLY good and very cheap. It’s now heading up the top of my list of local favourites. Two points to Alex. 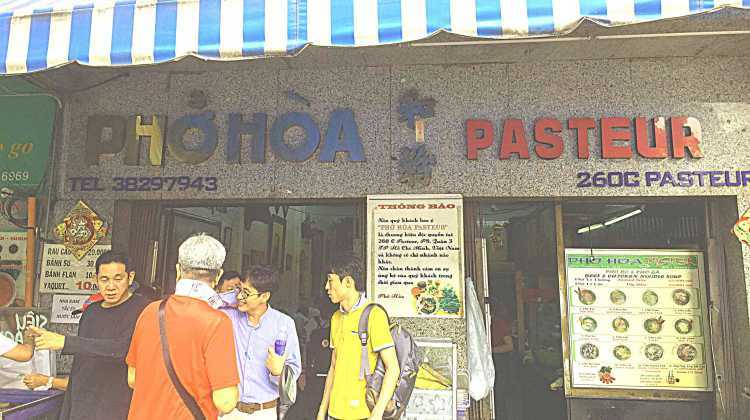 Allegedly the best Pho in Saigon – Have you been yet? So now I’m at the point where I get it…I don’t know as much about Saigon as I thought I did. But still, what else can Inspitrip offer for the average tourist? Why are they unique? then why not take a look at what Inspitrip has to offer. I know I’ve made a valuable new contact. You might too. And if you’ve taken a tour with the guys, I’s love it if you leave a comment down below on how you found the experience. Pho Hoa – Best Pho in Saigon? Note: I do not receive any payment for this post (or any others on the site for that matter unless I have a full disclosure!). I do receive a small amount of money by allowing advertisements on the site and any purchases made through those links. Previous story Playing Around at Board Game Station Coffee.